Chesapeake and Ohio Canal (commonly called the C&O Canal) in Maryland, features over 180 miles of fun and adventure. Make sure to check out the variety of fun opportunities - boat rides, hiking, biking - as well as hitting a visitor center for information on the history of the canal. 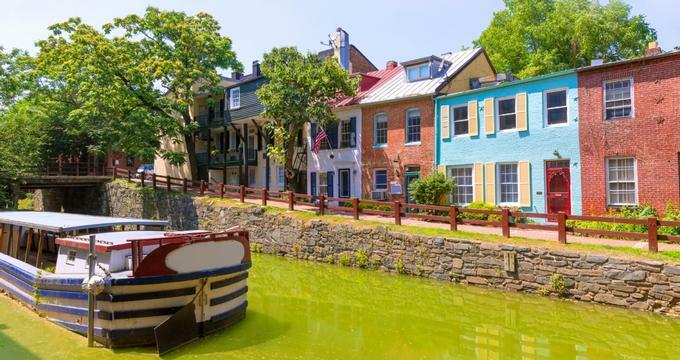 The canal has been in operation for around 100 years, and was originally built as a way to connect the communities that existed on the Potomac River as they traded lumber, agricultural products, and coal. Over time, the canal found itself in the center of transportation’s race towards technology, leading to a decline in the communities along the canal with newer options for transporting materials making the need for the canal basically obsolete. It now exists only for nature, education, and recreation as it is no longer used as a transportation canal. Visitor Center - As the canal encompasses a large area, there are multiple visitor centers along the path. Most are open seasonal hours and dates, although some are open all year round. The visitor centers exist to provide guests with information about the canal, overviews of hiking trails, and other history. It is highly recommended for guests to check at least one out during their journey. Boat Rides - Take a ride in one of the canal boats designed as replicas of some of the originals that graced the canal years ago. The boats are mule driven, just like they were in the mid to late 1800s. The period clothed park rangers describe life back then as well. Canal boat tours last around an hour and have a capacity of 65 people on a first come first serve basis (reservations can be made for groups of more than 10). There is a fee associated, with discounts for seniors and children (children under 3 ride for free). Billy Goat Trail - One of the most fun (and challenging) hiking opportunities along the canal is the Billy Goat Trail. This trail is divided into three different segments with beautiful scenery around the Great Falls area. The sections all involve varying degrees of rock climbing, so hikers must plan ahead and wear appropriate shoes. Be aware that the river is dangerous so wading, swimming, etc is strictly prohibited for safety reasons (fines will apply). Dogs are also only allowed on part B and C of the trail. Section A is the most challenging and it is also recommended that guests bring plenty of water as the dehydration risk is very real. Hiking - Besides the challenging Billy Goat, the C&O Canal has many other hiking trails that are more accessible for beginning hikers. There are maps available online as well as at the visitor’s center. Biking - Make sure to check ahead for accessibility for biking, as it is only allowed on the towpath due to its harder surface. Bike rental is available as well. Pay attention to restrictions that apply: speed limit of 15 MPH, single file riding, bikes must stay on the right and yield to mules, horses, and pedestrians, and bicyclists must make people aware that they are coming. National Parks make great learning opportunities and three different sites on the C&O Canal provide field trip opportunities. The education programs offered are curriculum based and have been developed with the help of local teachers to focus on STEM based subjects. They were created to make sure to align with Maryland state educational standards. They are offered in the spring and in the fall. Contact the canal at their dedicated education line for reservations and additional information. For classrooms that are unable to make it out, there are also options for lessons that can be done in school. These lessons involve a park ranger coming to the school (which makes for a lively and interactive experience for students) and are available in the winter. Teachers should make sure to check out the large curriculum section on the parks website which feature an up to date compendium of the many learning opportunities offered in detail. There are bookstores offered in many of the visitor’s centers along the C&O Canal. Their hours and open days vary by location, so check with the specific bookstore prior to a visit to verify. All bookstores are operated by Eastern National and a portion of the proceeds goes back into maintaining the canal and park.